No description of the 1st July 1916 attack on Serre by 31st Division would be complete without mention of the part played by the division's pioneer battalion, the 12th (Service) Bn. 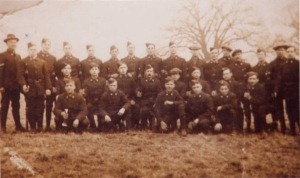 (Miners) (Pioneers) King's Own (Yorkshire Light Infantry), known as t'owd twelfth. 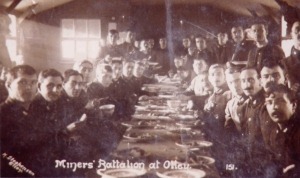 Above: At Farnley Park, Otley in December 1914. 12/61 Sam Facer is seated fourth from the right. Photograph by kind courtesy of Sam's son, John Facer. Click to enlarge Above: At Farnley Park, Otley. 12/97 William Townsend is sixth from the right on the back row; 12/57 Herbert Massey is second from the left on the back row; 12/27 Horatio Leeming is at the far left on the front row. Photograph by kind courtesy of John Facer. Right: James Stanley Lightfoot Welch. Photograph by kind courtesy of K Books. The pioneers reassembled at their assembly posts at 4.30 in the afternoon. 197 officers and men were reported as killed, wounded or missing, though the return of eight missing men on 4th July brought the number of casualties down to 189. 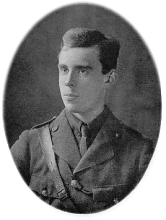 Of the events of 1st July 1916, the battalion's War Diary records: "Lts W. H. ROBERTS, H. D. GAUNT and 2nd Lts W. BAIRD, L. FORSDIKE especially showed coolness & energy during the attack 1/7/16. C.S.M. R. E. FREAKES displayed splendid discipline and pluck, & stopped a tendency among a few men to retire, he was assisted by C.Q.M.S. R. KEER who also displayed pluck & energy. Sgt. A. ADAMS was reported by his officer as splendid, though wounded early on. "3 Many more deeds of valour must have gone unrecorded in the devastation of No Man's Land. "British Regiments 1914-1918" by Brig. E. A. James (Naval and Military Press, 5th Ed., 1998). War Diary, 12th Bn., The King's Own (Yorkshire Light Infantry). Reproduction of the Battalion Instructions is by kind permission of Major C. M. J. Deedes and The Light Infantry Office (Yorkshire). "Wakefield Express", 15th July 1916. The author is grateful for the help of Major C. M. J. Deedes, and the staff of Wakefield Public Library.